1. MATERIAL: Steel, corrosion-resistant, Type A286 (UNS S66286) per AMS 5525, ANS 5735 or AMS 5737. 2. PLATING: 800°F nuts only. Silver plate all threaded surfaces on platenut per AMS 2410. Threads shall show complete coverage. Silver plating on all other surfaces optional. Tarnishing or discoloration of silver not cause for rejection. 3. MAGNETIC PERMEABILITY: Shall be less than 2.0 (Air = 1.0) for a field strength H = 200 oersteds using a magnetic permeability indicator per MIL-I-17214, or equivalent. 5. LUBRICANT: 450°F nuts only. Dry film lubricant approved in accordance with MIL-N-25027. Other lubricants soluble in the cleaner specified in MIL-S-7502. 6. 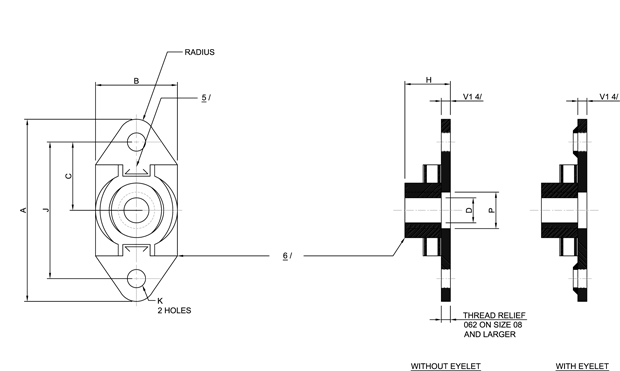 Horizontal float of nut element shall be not less than 0.020 inch radially from centered position in the plane normal to the thread axis. Vertical float of nut element shall be not greater than 0.020 inch for sizes 0.1120-40 thru 0.1900-32 and 0.027 for sizes 0.2500-28 and 0.3125-24. 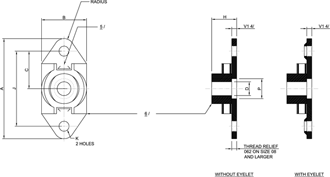 Nut element shall be capable of engagement with bolt in maximum misaligned position. 2. Surface Texture. In accordance with AMSI/ASME B46 1. Unless otherwise specified, the surface roughness shall not exceed 125 micro inches. 3. Performance. See procurement specification, excepts 450°F dry film lubricated nuts limited to five reuse cycles. 4. Design and Usage Limitations. These nuts are designed to develop the tensile strength of bolts and screws with an ultimate tensile strength of 125 KSI based on the cross sectional area at the basic root diameter of the thread. These nuts are designed to be used on 3A external threads. These nuts shall be used in accordance with the limitations of MS33588. Only nuts for which these are qualified products listed on QPL 25027 shall be used. 5. Interchangeability Relationship. MS21076 nuts can universally replace NAS 1068 nuts of like material, thread size, lubricants (dry film or silver plate), and rivet spacing. But NAS 1068 nuts cannot universally replace MS21076 nuts. 7. In the event of a conflict between the text of this standard and the references cited herein the text of this standard shall take precedence. 9. When fastening eyelet configuration nuts with bulb type rivets (blind fasteners), subtract 1/32 inch from the stack up of material and nut plate to calculate correct grip length.